Discover the most successful practices for landing a job. The session will cover multiple topics critical to the overall job search process. 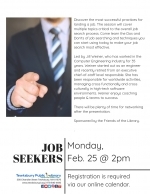 Come learn the Dos and Don’ts of job searching and techniques you can start using today to make your job search most effective. Led by Jill Weiner, who has worked in the Computer Engineering industry for 35 years. Weiner started out as an engineer and recently retired from an executive chief-of-staff level responsible. She has been responsible for worldwide activities, managing cross functionally and cross culturally in high-tech software environments. Weiner enjoys coaching people & teams to success. There will be plenty of time for networking after the presentation. Sponsored by the Friends of the Library.